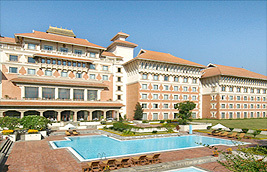 We have hand-picked a selection of what we consider to be the best properties and organizations to work with in Nepal. We believe that your visit to Nepal should be the trip of a life-time and by using the best-of-nepal you are ensured that little is left to chance. Nepal's finest Heritage-style hotel - The magnificence of Dwarika's is its buildings of intricate carved wood and terracotta work that must have taken 10 million hours of the best craftsmen in Nepal. Every brick is handmade and every piece of wood work a centuries old original. 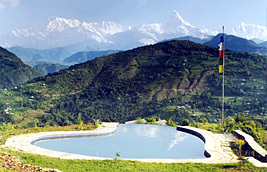 But Dwarika's is also about intimate luxury and the spirit and hospitality of the Nepali people. 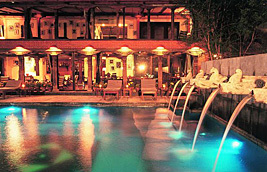 The Sacred Valley Inn, Kathmandu, is located on a lane in the tourist district of Thamel in an area known as Jyatha. The lane is a quieter option yet it is still in central Thamel and close to all the restaurants and shops. 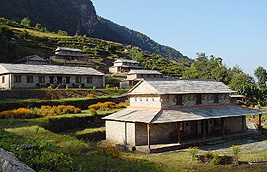 The Sacred valley Inn is simple and clean guest house that is run under joint Western and Nepali management. The owners also have a property in Pokhara that provides comfortable and affordable accommodation close to the Pokhara lakeside. Kathmandu is a luxury 5 star city resort hotel situated 10 Km from the centre of Kathmandu, Nepal, on the road to Boudhanath Stupa - the most holy of Tibetan Buddhist shrines outside Tibet. If you are looking for an internationally recognized quality hotel then this is it. Spectacularly situated 1,000 feet above Pokhara Valley with panoramic views of the Himalayas, it�s no wonder that Tiger Mountain Pokhara Lodge has won numerous tourism awards. Built in the style of the surrounding local villages, it is fitting that the Lodge has set new standards of hospitality for Nepal. The elegant rooms, each with twin or super-king sized beds and en suite bathroom, are arranged around the hilltop to maximize breathtaking views from your own private verandah. Located in the Annapurna foothills, we offer trekking using purpose built lodges that provide comfortable accommodation with attached bathroom facillities and superb staff. We own and manage a beautiful home-stay-style cottage to the north of Kathmandu on the edge of the protected Shivapuri National Park, looking down into the Kathmandu Valley. 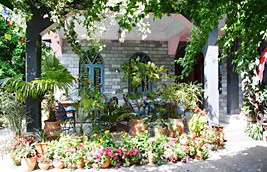 The cottage is an ideal escape from the hustle and bustle of Kathmandu. In the heart of the Royal Chitwan National Park, home to a multitude of wildlife and birdlife, Tiger Tops offers a charming and stylish jungle experience. From the lodge, discover all that the jungle has to offer. From the Lodge you can explore the surrounding jungle and grasslands on elephant-back, dug-out canoe, on foot or by jeep, in the safe hands of expert guides, some of whom have over 30 years of experience. 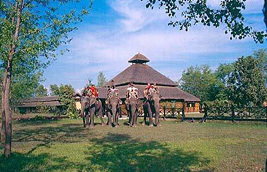 Enjoy nature at its best whilst staying at the idyllic and tranquil Tiger Tops Tented Camp. 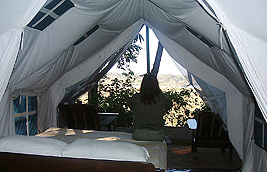 Each luxury safari tent is complete with a twin or double bed and an en suite bathroom with piping hot water. 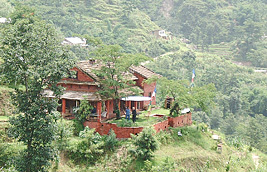 The Camp offers a close-to-nature experience that is unsurpassed in Nepal. 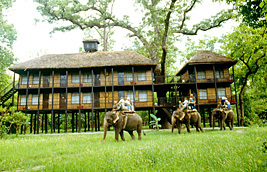 The Lodge is inspired by the lifestyle and rich culture of the indigenous Tharu people. The spacious and comfortable double rooms have en-suite bathrooms with solar-heated water. 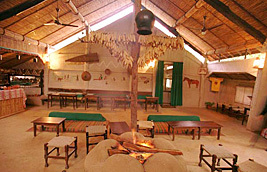 The Tharu Safari Lodge offers both wildlife and cultural plus resort activities. Situated in the far west of Nepal Tiger Tops offers an unsurpassed wildlife experience in the un spoilt and remote Bardia National Park. Do float trips on the great Karnali river and enjoy elephant safaris in search of tiger. In Bardia the chances of seeing tiger is 6 times greater than elsewhere!